The name "crazy ant" arises from its characteristic erratic and rapid movement not following trails as often as other ants. The antennae of a crazy ant have 12-segments without a club and are extremely long. The worker ants are relatively small (2.3 - 3 mm) and monomorphic having only one node between the propodeum, the first abdominal segment, and the gaster. The scape, the basal segment of the antenna, is extraordinarily long with the apex surpassing the posterior border of the head by at least one-half the scape length. Eyes are elliptical, strongly convex, and placed close to the back end of the head. Legs are extraordinarily long. The petiole, connects the thorax and abdomen, is wedge-shaped, with a broad base and inclines forward. A small round terminal orifice surrounded by a fringe of hairs, the acedipore serves for the application of venom both in defense and predation. They do not have a stinger but may bite an intruder and curve its abdomen forward to inject a formic acid secretion onto the wound. The body has long, coarse, well scattered, suberect to erect, grayish or whitish setae. The head, thorax, petiole, and gaster are dark brown to blackish, and the body often has faint bluish iridescence. The crazy ant is highly adaptable, living in both very dry and rather moist habitats. They often nests some distance away from their foraging area in such places as trash, refuse, cavities in plants and trees, rotten wood, in soil under objects and also have been found under debris left standing in buildings for long periods of time. 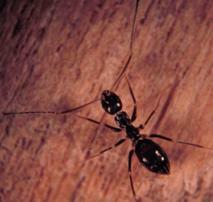 A crazy ant nest site can be found by looking for workers carrying food back to the nest. Because they forage a long distance away from their nests, controlling the nests can prove to be quite difficult. They are also found in gasoline stations, convenience stores, and sidewalk cafes. Workers are omnivorous, feeding on live and dead insects, seeds, honeydew, fruits, plant exudates, and many household foods including meats, grease, sweets, fruits, vegetables, and liquids. They apparently have a seasonal preference for a high-protein diet and during the summer months may refuse honey or sugar baits. Crazy ants are attracted to honeydew producing insects in spring and fall and obtain honeydew by tending aphids, mealybugs, and soft scales. Large prey items are carried via a group of crazy ants working in unison. The workers are known to gather small seeds of such crops as lettuce and tobacco from seedbeds and in cold climates, they nest in apartments and other buildings where they are potential pests year round. Colonies of crazy ants are moderate to very populous and may raise sexuals at any time of the year in warmer regions, but in a seasonal climate production is limited to the warm rainy months. On warm, humid evenings, large numbers of males gather outside nest entrances and may mill about excitedly. Workers patrol vegetation and other structures nearby and periodically, a dealate queen emerges. It has been suggested that mating occurred in such groupings around the nest entrance. New colonies formed through budding from original colony.